"The jewel at its center still reflects a pale image of its creator." This imagining of an edible lotus orb is actually my second attempt. Last year I made "Lotus Root Orbs," which were little spheres made out of lotus roots. They were finicky, and not particularly tasty, but I thought the name was pretty funny (and I love creating pun-based foods). For this year's The International, I decided to go with an approach more similar to the Magic Sticks or the Aghanim's Scepters, where the dish in question looks visually like the in-game Dota 2 item. Lotus Orbs appear to be white petals surrounding a shiny pink core. I toyed around with a couple of ways to make edible flower structures - I even considered savory lotus orbs made from onion flowers. I wanted an option that would be relatively easy to serve at a buffet-style snack table over the course of a 3-6 hour Grand Finals series, and that would consistently produce an attractive dish without being too finicky. In the end, this laundry list of criteria turned out to be best served by apple roses. 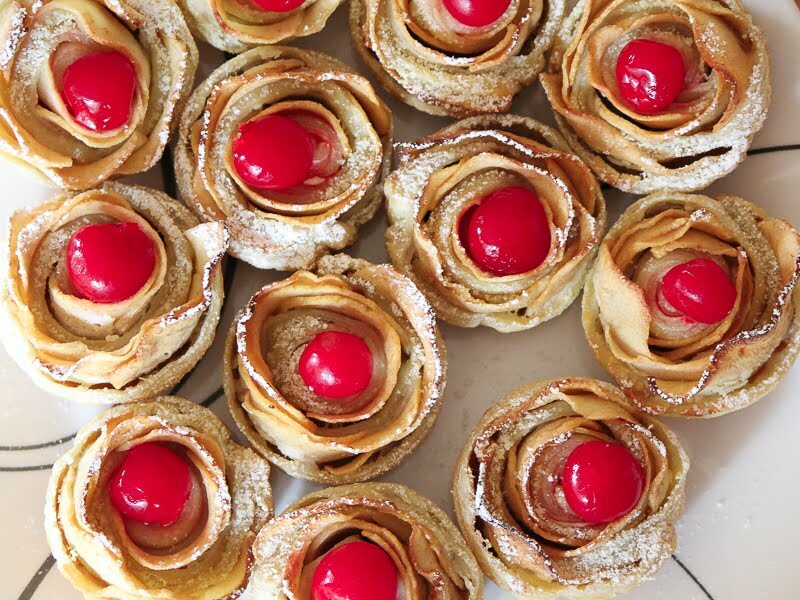 If you've ever watched a recipe gif, you've probably seen one for apple roses. There's good reason for their popularity - they look impressive, they're easy to make, and they only require a handful of ingredients. To turn these into lotus orbs, I dusted the "petals" with powder sugar to lighten the petals and added maraschino cherries to the center. With the added pop of color, I think the resulting dish actually looks more adorable than your run-of-the-mill apple roses, and is a pretty good match for a Lotus Orb. And is, of course, delicious. Lotus Orbs may just be a situational item for most heroes, but I think these are core for any Dota 2 menu. These are available in the frozen foods section of most grocery stores. Thaw overnight in the fridge, or at room temperature for half an hour. Warm to room temperature to make spreading easier. Preheat the oven to 350°F. Grease a muffin tin with butter, or line with muffin liners. Lotus orb petals are completely white, so we want to remove the apple skins! Peel the skin from the apples. If you have an apple corer, core the apples then halve them. If you don't have an apple corer, halve them, then cut out the core. With a mandolin, or with a sharp knife and a bit of patience, thinly slice the apple halves and place them on a plate. Microwave the apple slices for 2-3 minutes, or until soft enough to bend easily. Lightly flour a large cutting board or counter top. Roll out a pastry sheet to around 12x10 inches. Cut into six 2x10 inch strips. Spread cream cheese along half each pastry strip (to create a 1x10 inch cream cheese rectangle). Layer apple slides along the cream cheese-covered long edge of a pastry strip, leaving about half of the apple slice overhanging the pastry strip. Overlap each apple slice by about half a slice width. I like to start with the nice large pieces of apple, and taper o the smaller apple slices. Leave about 1-1.5 inches of pastry unadorned with apple. Fold the opposite side of the pastry over the apple slices. Starting from the bare end of the pastry, roll up the pastry into a tight spiral, then place in the muffin tin. 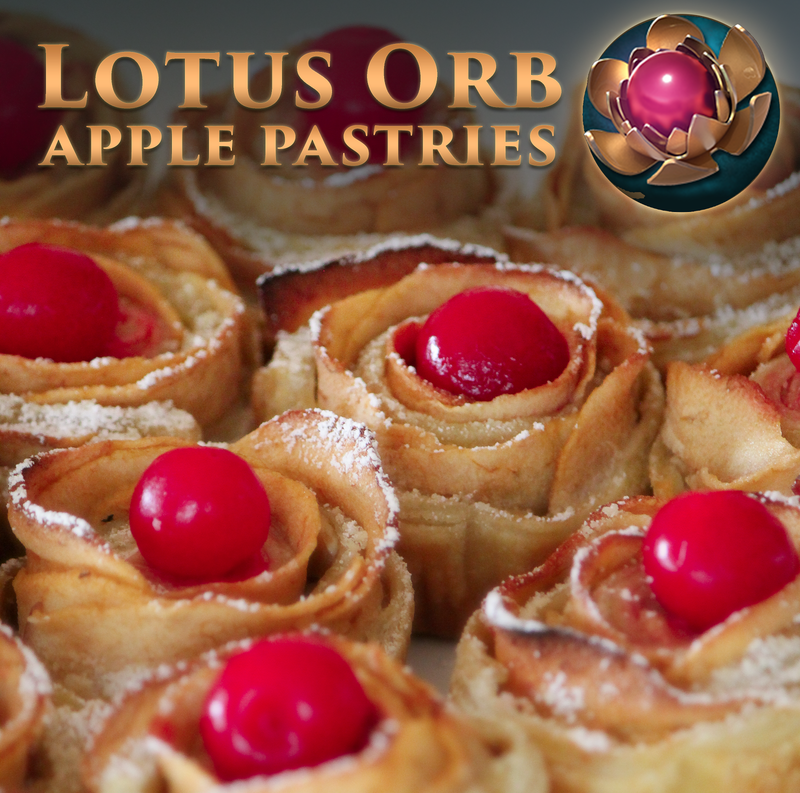 Repeat with the remaining pastry strips and with the second puff pastry sheet to create 12 lotus orbs. Bake for 20 minutes, then loosely cover with a sheet of aluminum foil to prevent the apple petals from burning. Bake for another 20-25 minutes, until your kitchen smells awesome and the pastry is fully cooked and golden. Transfer to a rack to cool. Using a sieve, dust the apple roses with powdered sugar. This is technically optional, but it looks pretty and it makes the lotus orb petals look a little more white. Place a maraschino cherry into the center of each orb. The International 2017 (TI7): Monkey King Mischief Cupcakes, Chocolate Pretzel Observers and Sentries, Dark Rift cake and more! The International 2016 (TI6): Glimmer crepes, Aghanim's Scepter Madeleines, Sheepsticks and more! The International 2015 (TI5): Magic Sticks, Clarities, Tango Fruit Salads and more!